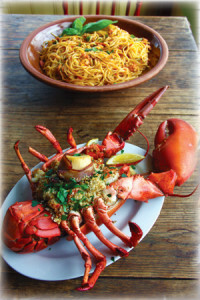 …no seafood is more emblematic of the bounty of our coastal waters than the lobster. Farmers of all stripes—from fruit and vegetable growers to those who provide us with beef, pork, and chicken—make eating local a healthful and pleasurable experience. But aren’t we forgetting someone? Despite our proximity to the sea, many of us often miss one of the most obvious sources of local food—the ocean. And, when we consider the hard-working folks at the foundation of our local food economy, fishermen are too often left out of the mix. For Massachusetts residents, no seafood is more emblematic of the bounty of our coastal waters than the lobster. According to Beth Casoni of the Massachusetts Lobstermen’s Association, there are approximately 800 active lobstermen in the state who each fish between 200–800 pots. Lobstering remains one of the few professions dominated by small, family-run businesses. And, in a way that harkens back to a different time, it is a craft that is often passed down through generations. Children—usually sons—learn to lobster from their dad, who, in turn, learned from his father. But in recent years, the industry has changed, forcing many families to adapt in order to remain in business. Keefe has been lobstering commercially for over twenty years but got his start much earlier. He began pulling traps at age five with his dad, who was a part-time lobsterman. The chance to work alongside his father, which he still does, was one of the factors that drew him into the profession. As his wife Danielle said, “It [lobstering] is in his blood.” After trying several other types of fishing, Craig returned to his roots, concentrating primarily on lobstering. He now owns two boats, but after he had been fishing successfully for many years, lower lobster prices and changing regulations prompted Craig and Danielle to expand their business in new directions. Last year, they opened a stand-alone seafood counter at Previte’s Market in Weymouth, and in early 2014 they launched a second location inside Crocetti’s Market in East Bridgewater. To date, their largest undertaking is the recent opening of their own retail location in Scituate, the Scituate Lobster Pound. Of course, the primary attraction of this charming store is the lobster and other local fish, such as cod and flounder, caught by Craig and other local fishermen. But it also features prepared foods such as lobster rolls, lobster pizza, lobster mac and cheese, and seafood salads. In addition, the Keefes sell a wide array of local products from Hornstra milk to Nella Pasta. Danielle commented, “We try to offer many wonderful local foods in one place and it is what people seem to like.” Their commitment to local foods runs so deep that even the lobster rolls are served on rolls baked by Duxbury’s My Little Bakery. The smallest customers are mesmerized by the store’s circular saltwater aquarium featuring crabs, starfish, lobster, and other treasures of the deep. Tim Field, of Revolution Lobster in Westport, is another lobsterman who followed in his family’s footsteps. His mom grew up in a fishing family and his dad, Albert, has been lobstering since the late 1960s. When Tim was young, he would lobster with his dad during the summers, and after high school graduation he began fishing full time. Although he first fished on draggers and scallopers, he eventually returned to lobstering and now, at age 29, he owns two boats, the Revolution and the Rock and Roll. 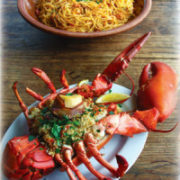 The store offers lobster, dry scallops, quahogs, steamers, littlenecks, and other freshly caught seafood and shellfish, in addition to some local South Coast favorites, such as Scrumbs seafood topping mix, made in Mattapoisett, and Sampson Farm potatoes, which are grown right in Westport. These potatoes also make an appearance in Revolution Lobster’s popular clam boil. Lauren uses social media to bring customers into the store, often posting updates on which freshly caught fish are in stock or recipes featuring their delicious seafood. Although he doesn’t have children, Tim said that if he did, he would be happy to have them join the business as long “as they wanted to and knew the business has its challenges.” The Keefes have three sons, ages three, five, and ten. When asked if he hoped they follow in his footsteps, Craig said, “sadly and honestly no. I show them how it works and how to fish but we want them to have another career. It is a tough way to go.” Massachusetts has a proud tradition of lobstering, but its lobstermen are facing tough times. For those of us living on the South Shore and South Coast, let’s remember lobster and seafood are the quintessential local food—healthy, delicious, and sold by small family businesses that need our support. Crocetti’s Market in East Bridgewater. Growing up in Ohio, Julia Powers thought lobster was reserved for special occasions. After living on the East Coast for many years, she now cooks with lobster much more regularly, using it in everything from risotto to lobster avocado club sandwiches.